By now you've probably heard about Square Enix's Murdered: Soul Suspect , or Ghost Cop, as I like to call it. It's a little hard to wrap your head around what Soul Suspect actually plays like. Is it a shooter? An adventure game? A match-3 game? Well, probably not the latter, but if you want to know what Murdered: Soul Suspect is all about, its recently released "101" trailer should get you up to speed. 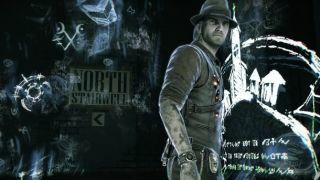 In Murdered: Soul Suspect you play as Ronan O'Conner, a Salem police detective who wears a fedora in defiance of good taste—even in death. The story starts with O'Conner's death. He then spends the rest of the game investigating his own murder as a ghost. Ghost Cop! Murdered: Soul Suspect is interesting because it takes the detective aspects of the game seriously. You gather clues, use your ghostly abilities to read minds, and deduce an answer in a way reminiscent of the upcoming Sherlock Holmes: Crimes and Punishments . The more action-oriented elements are still a little confusing, even after watching the trailer. The game is played in third-person, and it looks like the only enemies you'll be fighting are other ghosts or demons, but not by shooting them. Maybe it's more about avoiding them. Maybe Ghost Cop has a Ghost Gun. I don't know. I'm on a track to get a D- in Murdered: Soul Suspect 101.